Should a wedding ceremony during which the bride forgets the groom’s name be considered valid? That question may sound slightly preposterous, but I just witnessed it happening. Many of the couples who marry in these ceremonies are matched by their parents or, if they are determined to be especially blessed, they are “randomly” matched by the church leader (presently the widow of their messiah). Reportedly, each match takes about thirty seconds as the prophets place the hands of men and women together in divinely appointed relationships. Officially, a person can decline their match after they’ve had a little time to talk with their future spouse, but it’s evident that contradicting the action of one’s savior would require immense courage. Knowledge can last, principles can last, habits can last; but feelings come and go… But, of course, ceasing to be “in love” need not mean ceasing to love. Love in this second sense — love as distinct from “being in love”—is not merely a feeling. It is a deep unity, maintained by the will and deliberately strengthened by habit; reinforced by (in Christian marriage) the grace which both partners ask, and receive, from God. . . . “Being in love” first moved them to promise fidelity: this quieter love enables them to keep the promise. It is on this love that the engine of marriage is run: being in love was the explosion that started it. 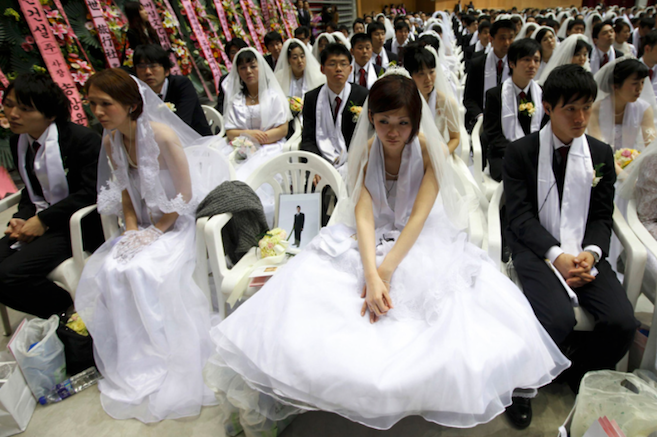 In the case of Unification Church members, even if the relationship lacked an emotional stage of “being in love,” it doesn’t mean that it is destined to fail. Far from it, since, as Lewis wisely points out, true love isn’t about feelings. In the aforementioned case, the bride was from a French-speaking African nation. The husband, I believe, was from Japan. Her English was quite good, but his was poor. They were essentially unable to communicate. Then, when the interviewers revisited them immediately before the ceremony was to begin, they asked the beautifully-gowned bride what her husband’s name was. And she had forgotten. Another peculiar thing about Unification marriage practices is that, following the wedding, there is a 40+ “separation period,” during which they are required to refrain from intimate relations. While Christians are called to practice premarital chastity, I’m unfamiliar with any other group that requires a post-wedding purification. One last comment about the Unification marriage blessings. As if they could not be more bizarre. In 1997 the Moons presided over a ceremony in Washington, D.C. While only 2,000 of the 30,000 couples were actually being married, among the other 28,000 couples having their marriage “blessed” by the Unification messiah included a prominent American political figure—none other than Al Sharpton. At least he and his wife, Katherine, probably knew each other’s names. The picture above comes from one of the group weddings. This young bride has to be content with the photograph of her absent groom. One wonders if the two have yet to meet. We naturally appreciate the memory of those whose work has contributed to our lives. And that’s fine. But when we begin to focus more on them, than on the real, breathing people around us, our priorities are skewed. In 1989, Hollywood released a film entitled “Dead Poet’s Society.” It was nominated for an Oscar for Best Picture, and ironically won the Oscar for Best Writing. In the movie, an English teacher awakens his moribund students to literature, and the more reflective aspects of life. A special treat in the selection is his coining of the word which inspires the title of this post. There is a reaction at present going on against the excessive love of pet animals. We have been taught to despise the rich, barren woman who loves her lap dog too much and her neighbor too little. It may be that when once the true impulse is inhibited, a dead poet is a nobler substitute than a live Peke, but this is by no means obvious. You can do something for the Peke, and it can make some response to you. It is at least sentient; but most poetolaters hold that a dead man has no consciousness, and few indeed suppose that he has any which we are likely to modify. 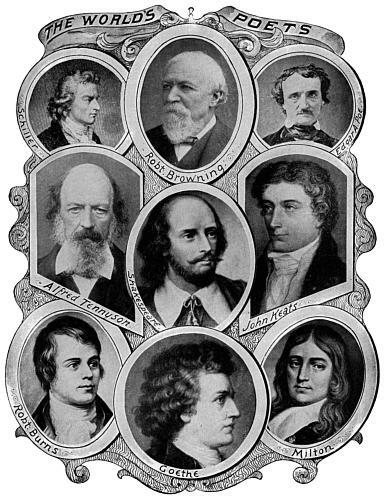 Unless you hold beliefs which enable you to obey the colophons of the old books by praying for the authors’ souls, there is nothing that you can do for a dead poet: and certainly he will do nothing for you. He did all he could for you while he lived: nothing more will ever come. I do not say that a personal emotion towards the author will not sometimes arise spontaneously while we read; but if it does we should let it pass swiftly over the mind like a ripple that leaves no trace. Lewis alleges our emotional “bonds” with departed writers are fruitless, imaginary, and perhaps even detrimental. I agree that when they displace our connections with living people, it is tragic. While I rarely disagree with the Magister Lewis, I will in this case. I would make an exception to his argument—in a single sense. For Christians, our filial affection for a departed Christian writer, is a unique case. The distinction being the fact, that in light of the resurrection, and the gift of eternal life, we are not talking about others who are permanently severed from a genuine relationship with us. On the contrary, there are many other disciples of Jesus living today who feel a powerful connection to writers like Lewis himself. And, with all eternity ahead, there should be ample time for each of us to enjoy his company, and thank him for the blessing he bequeathed to us through his work. I recognize that it may be in questionable taste, but the subject of departed artists reminds me of a humorous song from Monty Python’s Flying Circus. It’s called “Decomposing Composers,” and the modestly disconcerting lyrics are rendered in a somber, classical manner. If interested, you can listen to it here. ** Last year I approached this same passage by Lewis from a different perspective. If you would like to read some thoughts related to pet fads, check them out here. As a father whose military service required extended separations from my children, I wish technology had been about three decades more advanced than it was while I was in uniform. As a grandfather who has most of his grandkids living hours away, I’m grateful to be alive during an era when we can still nurture close relationships despite geographic separation. There are many wonderful ways to keep in touch across the miles. And, a new program adds a wonderful touch to the time proven joy of reading to our children. It’s called Kindoma, and more about it momentarily. 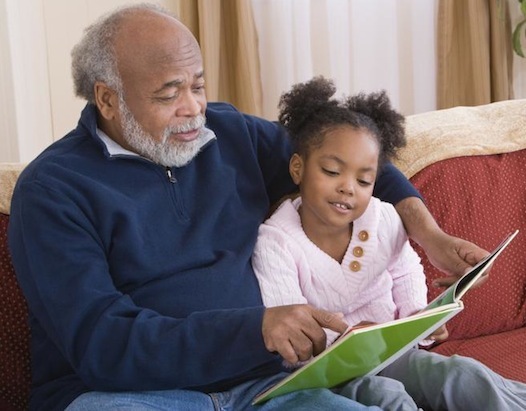 It’s a little known secret that there are few—very few—activities children love more than reading with a loved one. It’s not just about the book, it’s also about relationships and bonding. Eight years earlier, at the modest age of thirty-seven, he wrote to a good friend, “I theoretically hold that one ought to like children, but am shy with them in practice.” Lewis isn’t alone in possessing this unfortunate trait, which from my observation [political incorrectness alert] is more common among men than women. Of course, in our increasingly equalitarian culture it does seem that character flaw is becoming a bit more gender-balanced. Then there is the fact that many of us who dearly love our young progeny, enjoy the children of our friends, and hold genuine compassion for young ones suffering in any variety of miserable conditions . . . do not particularly seek out the company of children. From my personal perspective, I feel like I “expend” all of my (admittedly finite) kid-patience with my own kin and the offspring of my friends. I don’t have a surplus left after spending a significant amount of time with the (precious) little ones. At the same time as I admire teachers who can pour themselves into little ones, and I am absolutely dumbfounded by people who prefer working with young teenagers, I recognize that the world works well when some of us are better equipped to work with adults also . . . so the entire spectrum of learners is served. Recognizing our own prejudices is a prerequisite to suppressing or evicting them. Lewis, of course, was extremely concerned about children and their upbringing, particularly their education. Returning to the subject of how to nurture relationships with children through the intercontinental reading of books, technology has made the miraculous possible. Kindoma is novel in the sense that it allows you to read the book together (either the child or the adult can be the actual “reader”) while you actually turn the pages of the etext together! So you get the genuine experience of reading together. The creator of the program holds a PhD in Computer Science. So he’s not merely an idea guy (like me) who comes up with a slew of amazing concepts but doesn’t have the scientific skill to make them reality. The program is currently available for ipod and ipad. I’m sure it’s just a matter of time before it is ported to other operating systems. Since I still use “regular” desk and lap-top computers, I haven’t experimented with it myself. The app itself is free. I’m unsure about their revenue stream, whether it will come from ads, or purchase of access to a specific library, but it’s definitely worth checking out. 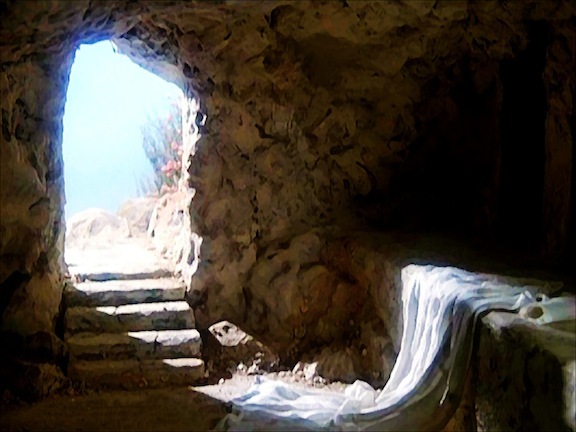 That’s precisely what separates Christianity from every other religious faith; for two millennia, Jesus’ disciples have followed a resurrected and living Lord. This is what non-Christians are ultimately unable to fathom. Christianity is far more than the adoption of a particular lifestyle. It is infinitely more than a cognitive acquiescence a set of doctrines. It is nothing less than a dynamic, living relationship with our Creator through his only begotten Son. Many regard Jesus as a great teacher from an ancient epoch—whose words are worthy of preserving. This is a good thing . . . but it’s not Christianity. Many consider Jesus the model of a noble life—and strive to emulate his compassion and humility. This too is a good thing . . . but it’s not Christianity. Many regard Jesus as an object of superstition—and they spout religious jargon while living hypocritical lives utterly devoted to their carnal appetites. This is not a good thing . . . and it’s most certainly not Christianity. C.S. Lewis refers to this inherent inability to “persuade” an unbeliever to see beyond Christianity as a creedal profession or even a simple lifestyle and comprehend it as a relationship. Our opponents, then, have a perfect right to dispute with us about the grounds of our original assent. But they must not accuse us of sheer insanity if, after the assent has been given, our adherence to it is no longer proportioned to every fluctuation of the apparent evidence. They cannot of course be expected to know on what assurance feeds, and how it revives and is always rising from its ashes. They cannot be expected to see how the quality of the object which we think we are beginning to know by acquaintance drives us to the view that if this were a delusion then we should have to say that the universe had produced no real thing of comparable value and that all explanations of the delusion seemed somehow less important than the thing explained. That is knowledge we cannot communicate. But they can see how the assent, of necessity, moves us from the logic of speculative thought into what might perhaps be called the logic of personal relations. What would, up till then, have been variations simply of opinion become variations of conduct by a person to a Person. Credere Deum esse turns into Credere in Deum. And Deum here is this God, the increasingly knowable Lord. (C.S. Lewis, “On Obstinacy in Belief”). Ultimately, inviting others to share the joy and peace that we disciples of Jesus know—undeserving as all of us are—is not about persuasion. It is about introducing them to Jesus.